Listen! For I sing of Owen Thorskard: valiant of heart, hopeless at algebra, last in a long line of legendary dragon slayers. Though he had few years and was not built for football, he stood between the town of Trondheim and creatures that threatened its survival. There have always been dragons. As far back as history is told, men and women have fought them, loyally defending their villages. Dragon slaying was a proud tradition. But dragons and humans have one thing in common: an insatiable appetite for fossil fuels. From the moment Henry Ford hired his first dragon slayer, no small town was safe. Dragon slayers flocked to cities, leaving more remote areas unprotected. Such was Trondheim’s fate until Owen Thorskard arrived. At sixteen, with dragons advancing and his grades plummeting, Owen faced impossible odds armed only with a sword, his legacy, and the classmate who agreed to be his bard. Listen! I am Siobhan McQuaid. I alone know the story of Owen, the story that changes everything. Listen! Why did I read this book: This book has been published in March but flew completely under my radar until recently when folks started talking it up in their half-year mark lists. I grew curious. Listen! 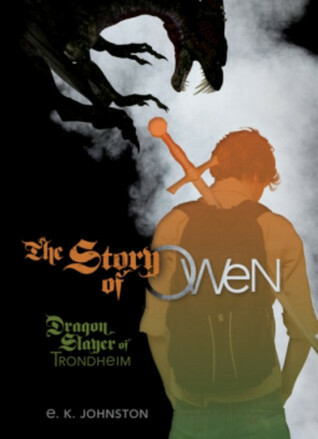 The Story of Owen: Dragon Slayer of Trondheim is a delightful book. Unexpectedly rich in both scope and depth, incredibly fun but also very touching. Set in a world much like our own but one where dragon attacks are a part of daily life, The Story of Owen: Dragon Slayer of Trondheim explores the way the very existence of dragons have shaped and altered not only the landscape but fundamentally, the ways people live. In this story, dragons are naturally attracted to carbon emissions and small things like driving a non-hybrid car or lighting a bonfire could mean your death. Most dangerous of all are the big cities (Michigan for example, is no longer inhabitable by humans) and so people have adapted and moved to rural locations where the buildings and infrastructure are specially designed to withstand dragon attacks. But forget buildings and things, the most prized jewel a small town could boast to have is a dragon slayer. Unfortunately nowadays dragon slayers are corporate and government employees, sent to protect factories and oil refineries. It is against this backdrop scenario that The Story of Owen takes place. Owen Thorskard is a budding dragon slayer in a rural town in Canada. The nephew of the recently retired Lottie Thorsgard, the greatest dragon slayer the world has ever known, Owen is – much like the rest of his family – destined for great things. And this book both is and isn’t his story. Instead, this is the story of his new town and of his times. About how his family, led by his aunt Lottie and her blacksmith wife Hannah, are attempting to start a revolution, to change traditional dragon slaying to make it possible for anyone to become one and for small towns to be as well-protected as the bigger cities and factories. Part of their mission is to bring back the bards that usually followed the dragon slayers. Enter Siobhan McQuaid, down-to-earth musician and maths geek who, as Owen’s bard, is the person narrating this story. By doing so, she makes it not only her story too but also a tale that grows and expands to include a fabulous take on storytelling, music and history making. And therein lies the delight in reading The Story of Owen: in Siobhan’s voice, her storytelling skills and the reflection about the world at large. There are stories she tells that are lies: the ones to protect others or embellish a tale. She needs to learn how to deal with those. There are stories that are true: these are the ones about sacrifice and heroism – and she needs to learn how to deal with those too. Interspersed through her narrative are fun snippets about the world’s history (my favourite is the retelling of Abelard and Eloise’s story as two dragon slayers) and morsels of foreshadowing for the future (it’s obvious that Siobhan is telling this story from a point well ahead). The latter is perhaps the biggest source of frustration with the novel due to the cryptic nature of certain bits of information that are never explored within this first novel (a sequel is in the works). Similarly, I’d have loved to see a more serious reflection about the ethics of bards as presented to Siobhan – she is told to shape stories that will meet Lottie’s lofty goals and interests but there is little questioning about potential corruption and distorting of stories to meet an agenda (even if an agenda for the greater good). But those are the only discordant notes in an otherwise sound debut (!!) novel. Allow me to sing the praises of how, on top of everything else, there is also a plethora of important, strong, well-developed female characters who kickass in a myriad of different ways, that the most prominent set of parents in the novel are a lesbian couple, and that Owen and Siobhan’s relationship never, ever moves beyond friendship. Before the Thorskards came to Trondheim, we didn’t have a permanent dragon slayer. When a dragon attacked, you had to petition town hall (assuming it wasn’t on fire), and they would send to Toronto (assuming the phone lines weren’t on fire), and Queen’s Park would send out one of the government dragon slayers (assuming nothing in Toronto was on fire). By the time the dragon slayer arrived, anything not already lit on fire in the original attack would be, and whether the dragon was eventually slayed or not, we’d be stuck with reconstruction. Again. I truly enjoyed this book for all the reasons you highlight, especially because it’s just fun. Not that serious things don’t happen, but this story builds up a solid base of support and strength and love that allowed me to tackle the bad parts as well. My take on the “ethics of barding” is that it’s like when we learned about the difference between “accuracy” and “precision” in statistics. There is truth and there are facts, and both are important; but some stories require a more factual basis, and other stories need above all to be true, and the good bard learns which fits a particular situation. I think (in this sense) THE TALE OF OWEN is a very true story! I am disappointed–if, sadly, unsurprised–to find that my library doesn’t carry this one. I’ll have to keep my eyes open for it. I’ve been hand-selling this book forever – so happy to see it getting some more online love. Seriously, people, if your local library doesn’t have this book, GET THEM TO ORDER IT. If your local indie store doesn’t have it … SEE ABOVE. Well worth reading! Hapax? Is that the hapax I used to know? I hope, if there’s a sequel, it’ll have more Sadie in it; I thought she was woefully underused. But Siobhan and Owen’s friendship is wonderful, as are Owen’s aunts. speaking of Owen’s aunts, I appreciated that this YA novel managed to pull off “kids save the world” (or at least the town) without resorting to “adults are useless.” The adults in this book are all, in their different ways, very useful indeed.